It was clear even before we joined the European Economic Community (as it was called then) that it was much more than just a free trading arrangement. "One thing is certain. As a member of the Community, Britain would have a strong voice in deciding the nature and the timing of political unity. "By remaining outside, we could be faced with a political solution in Europe which ran counter but which we could do nothing to influence." That's hardly stating that the European Community was only about 'free trade'. “The community which we are joining is far more than a common market. It is a community in the true sense of that term. Again, that's hardly stating that the Community was only about free trade. 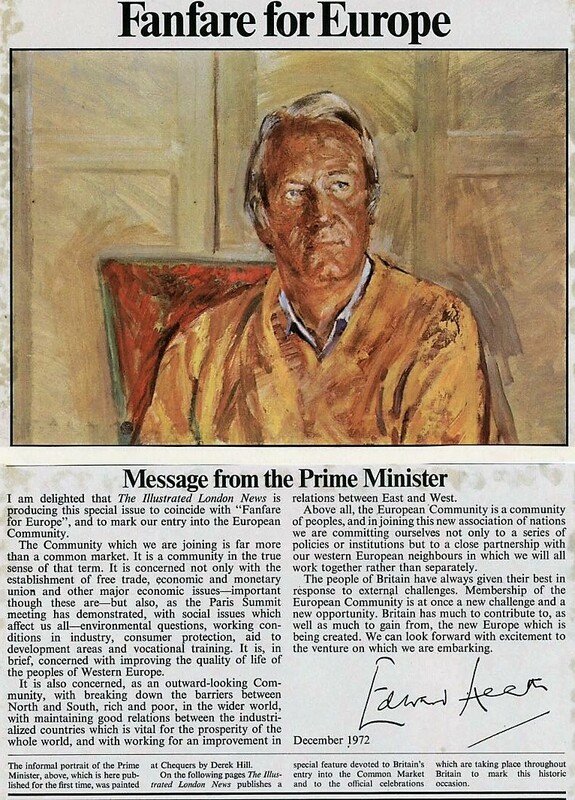 In 1975, two years after we joined, the new Labour government held a referendum on whether Britain wanted to remain in the European Community – the exact same referendum as we had in 2016. 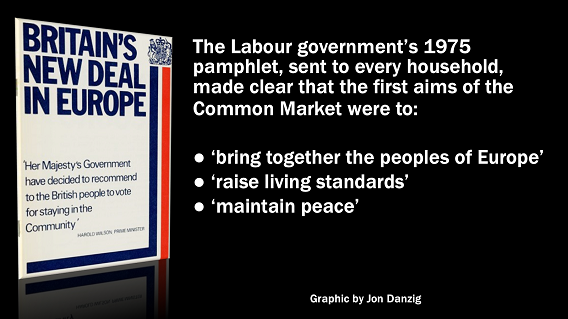 The government’s pamphlet sent to every UK household for the referendum stated that the first aims of the Common Market were to ‘bring together the peoples of Europe’, to ‘raise living standards’ and ‘to maintain peace’. The pamphlet made clear that as a member, Britain has a ‘say in the future economic and political development of the Common Market.’ If we left the Common Market, ‘Britain would no longer have any say’. "We must ensure that no effort it spared in telling people the basic reasons why it is in Britain's interest to remain a member of the the European Community." "The Community gives us peace and security in a free society, a peace and security denied to past generations. At a time of uncertainty in world affairs, if we wish our children to continue to enjoy the benefits of this peace, our best course is to stay in Europe." "The Community gives us access to secure sources of food supplies. "The Community gives us the opportunity to represent the Commonwealth in Europe. "The Community gives us access to the world's strongest trading group. "The Community gives us a chance to influence world affairs." 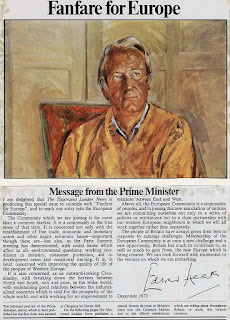 It could not have missed anyone’s attention at the time of the 1975 referendum that the European Community was about much more than just free trade. Even the Eurosceptics of the time claimed that membership of the Common Market went beyond ‘free trade’. Although in over 40 years of membership the fears and warnings of the 1975 ‘NO’ campaign have not materialised, their arguments haven’t changed. In fact, the 2016 referendum has simply regurgitated the same old arguments that took place in the first referendum. There is little difference between the European Economic Community of 1975 and the European Union of today. They share the same foundational principles and aspirations. Of course, in over 60 years since its foundation, the European Community has grown phenomenally, with more countries wanting to join. But that just demonstrates the success of the EU project. The Conservative government under David Cameron could have saved a fortune by simply re-printing the 1975 referendum pamphlet and distributing it for the 2016 referendum. Almost all the points and arguments remain the same. Nothing much has changed. Read the Labour government’s 1975 pamphlet and judge for yourself.